1) Sprinkle seasoning salt on both sides of six chops. 2) Dip lightly in flour. 3) Place chops in 1/4 pound melted margarine in skillet. 4) Add two sliced Italian red onions. 5) Add cooked onions and cook until golden. 7) Add cooked onions to top of chops. 8) Brown chops on one side, then turn replacing onions on the top side. 9) Place in pre-heated 300 degree oven. 10) After 15 minutes turn oven heat to 250 degrees for 25 minutes. 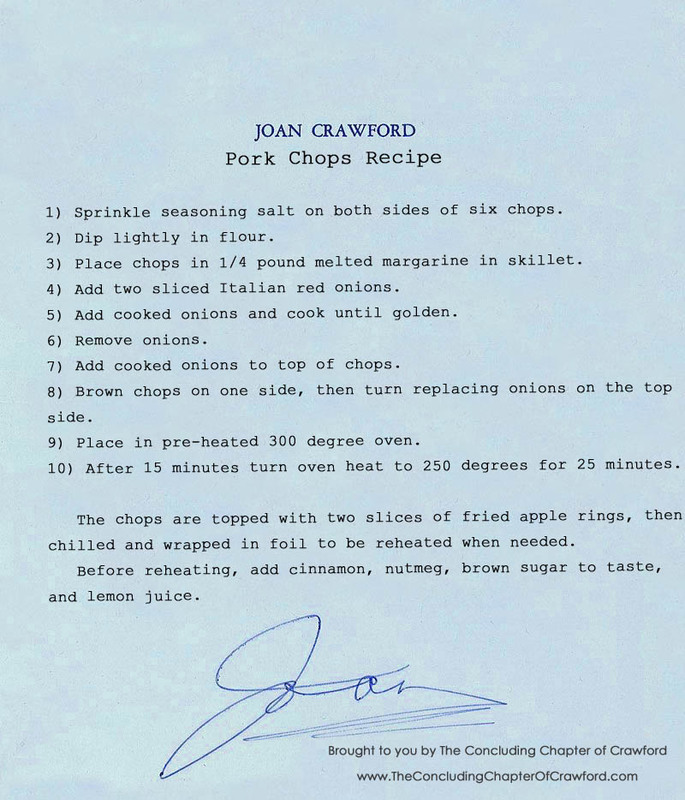 The chops are topped with two slices of fried apple rings, then chilled and wrapped in foil to be reheated when needed. Before reheating, add cinnamon, nutmeg, brown sugar to taste, and lemon juice. Add potatoes and eggs; toss lightly. Combine cabbage, pimiento, green pepper and chili peppers. 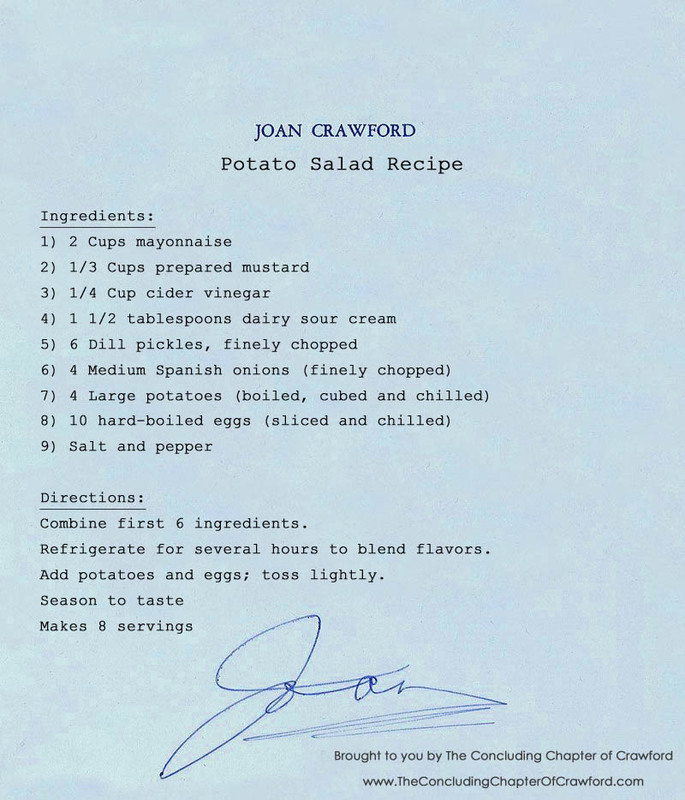 In a separate bowl blend together mayonnaise, lemon juice, dry mustard, which has been mixed with the vinegar to a smooth paste, and prepared mustard. 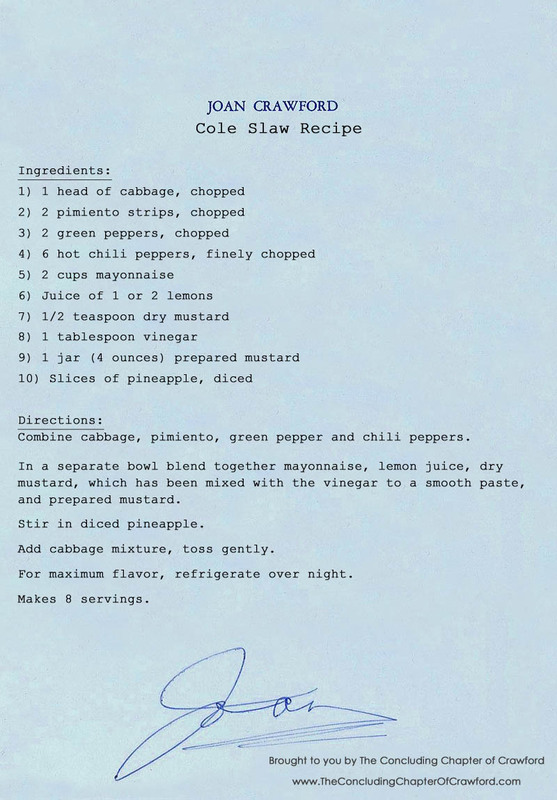 Add cabbage mixture, toss gently. For maximum flavor, refrigerate over night. Combine meats, unbeaten eggs, onion, green pepper, 1 tablespoon of the seasoning sauce and meat sauce. In large shallow baking pan shape mixture into oval loaf. Gently press hard-boiled eggs into loaf..
Sprinkle remaining seasoning salt, Worcestershire and hot pepper sauce over loaf. Bake at 400 degrees for 1 1/4 hours, basting frequently with pan juice. Do not let butcher mix sirloin and veal at time of purchase. Put ground sirloin, veal, pork sausage and raw eggs in shallow baking pan. Mix thoroughly. Add finely chopped onion and green peppers and mix thoroughly, once again. 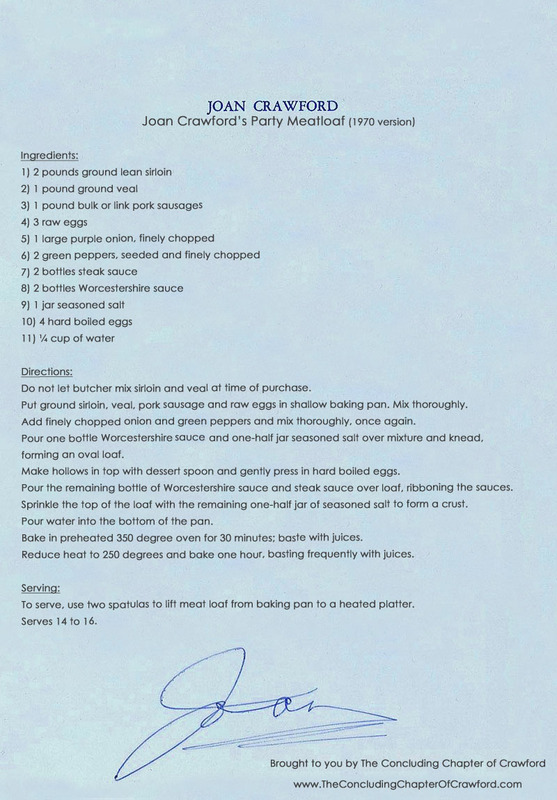 Pour one bottle Worcestershire cause and one-half jar seasoned salt over mixture and knead, forming an oval loaf. Make hollows in top with dessert spoon and gently press in hard boiled eggs. 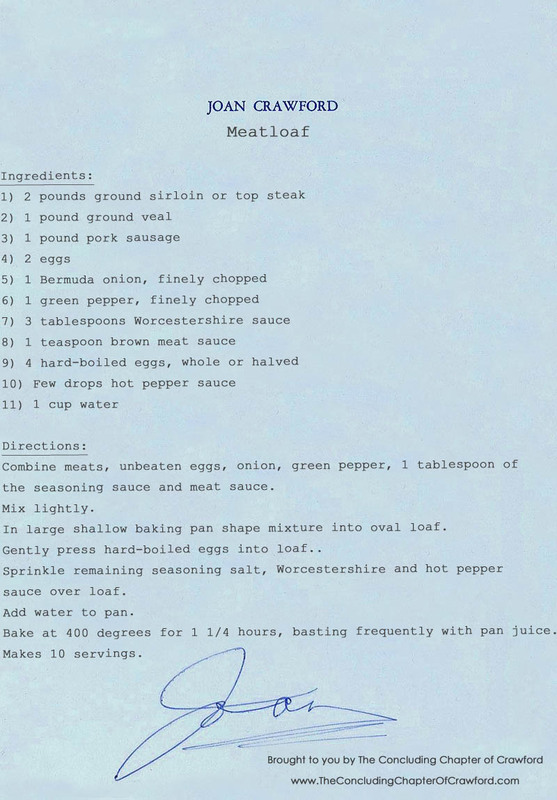 Pour the remaining bottle of Worcestershire sauce and steak sauce over loaf, ribboning the sauces. Sprinkle the top of the loaf with the remaining one-half jar of seasoned salt to form a crust. Pour water into the bottom of the pan. Bake in preheated 350 degree oven for 30 minutes; baste with juices. Reduce heat to 250 degrees and bake one hour, basting frequently with juices. To serve, use two spatulas to lift meatloaf from baking pan to a heated platter. 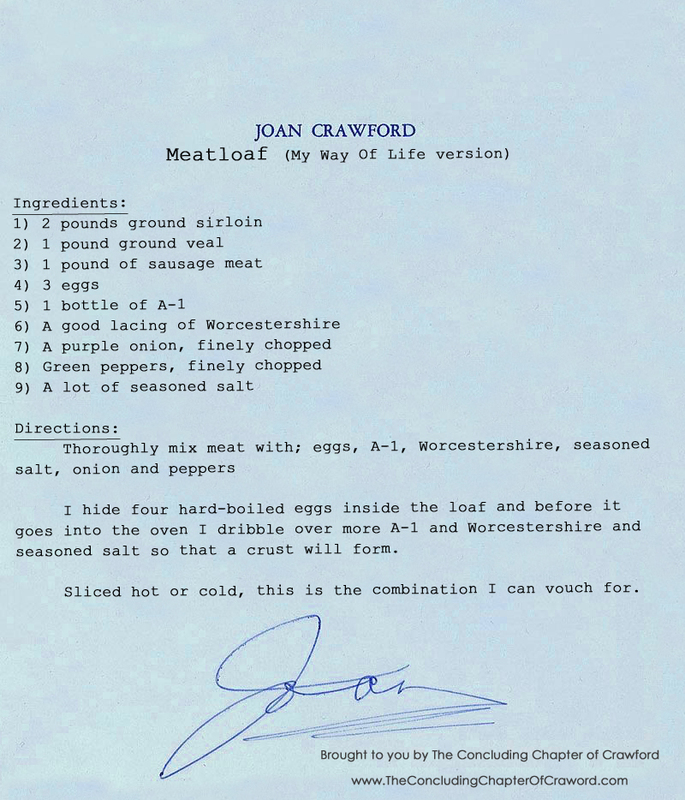 For reference, here is also the exact meatloaf recipe Joan gives in "My Way of Life"
I hide four hard-boiled eggs inside the loaf and before it goes into the oven I dribble over more A-1 and Worcestershire and seasoned salt so that a crust will form. Sliced hot or cold, this is the combination I can vouch for. Core and slice apples into thick rings, but do not peel. ​Heat margarine or butter in skillet. 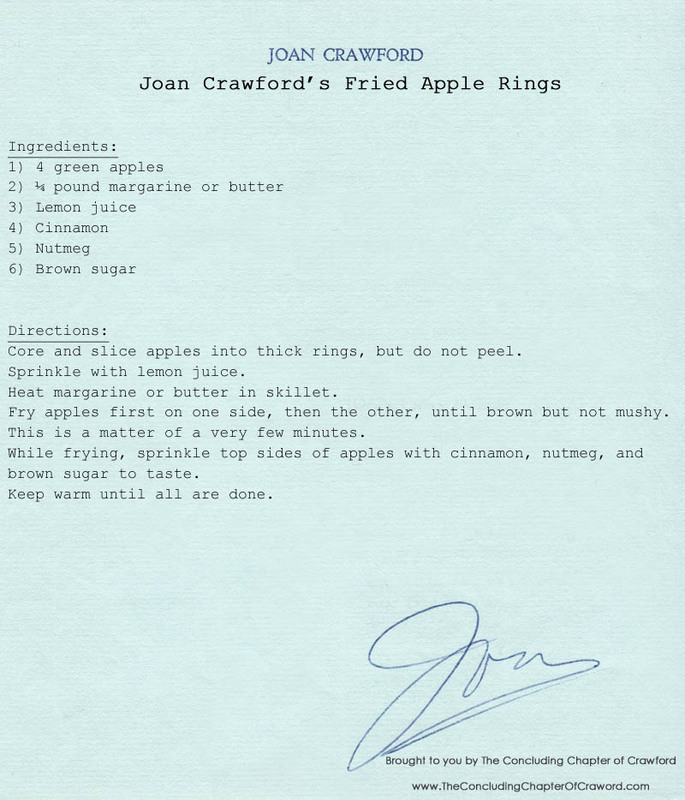 ​Fry apples first on one side, then the other, until brown but not mushy. This is a matter of a very few minutes. ​While frying, sprinkle top sides of apples with cinnamon, nutmeg, and brown sugar to taste. Keep warm until all are done. Cover one side of beef with Lawry’s Seasoned Salt and marinate for ½ hour. ​Turn beef on other side, cover with Lawry’s Seasoned Salt, marinate for ½ hour. ​Put beef in heavy stew pot and cover with water. ​Put on slow fire. Bring to a boil. Skim. ​Add 3 cups of water, and onions, celery, carrots, parsnips, not cut up. Season with kosher salt and black pepper, to taste. Boil for ½ hour. 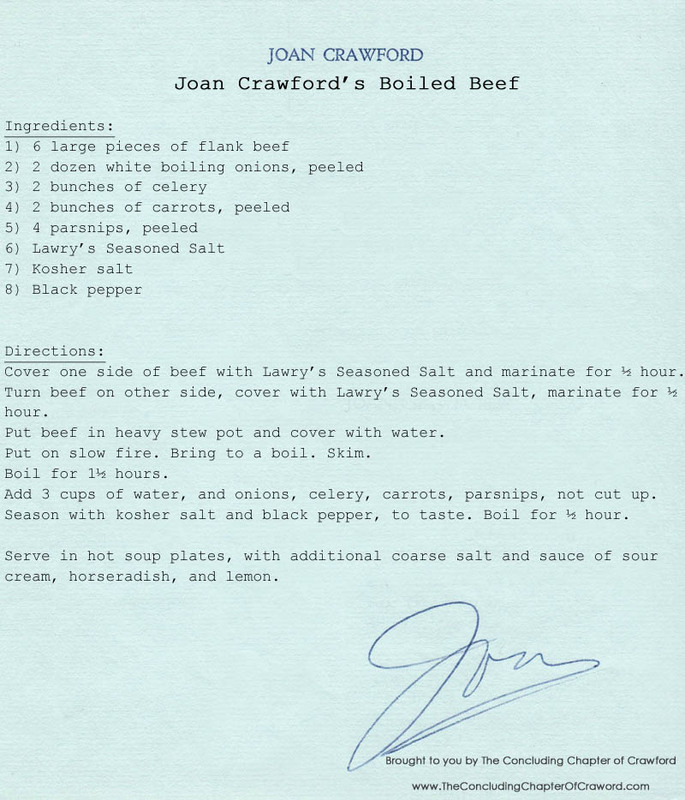 Serve in hot soup plates, with additional coarse salt and sauce of sour cream, horseradish, and lemon. 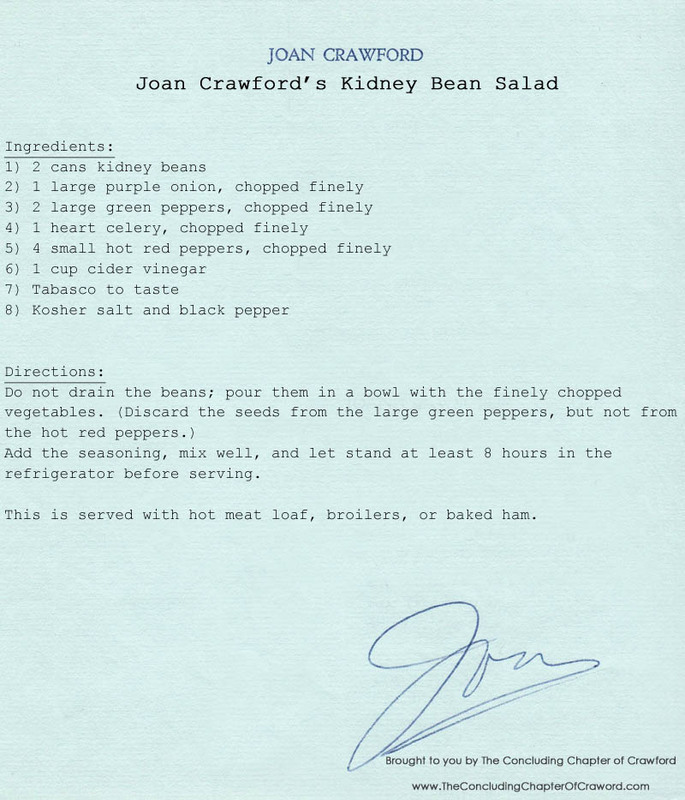 ​Add the seasoning, mix well, and let stand at least 8 hours in the refrigerator before serving. This is served with hot meat loaf, broilers, or baked ham. Wash the spinach and place in the refrigerator until crisp. Do not cut leaves. ​Fry the bacon; drain on stove on paper towels. Save a thin layer of grease in skillet, add 1 cup cider vinegar, warm a second, then pour, hot, on the spinach; season. ​Break the bacon in small bits and sprinkle on top of the salad. 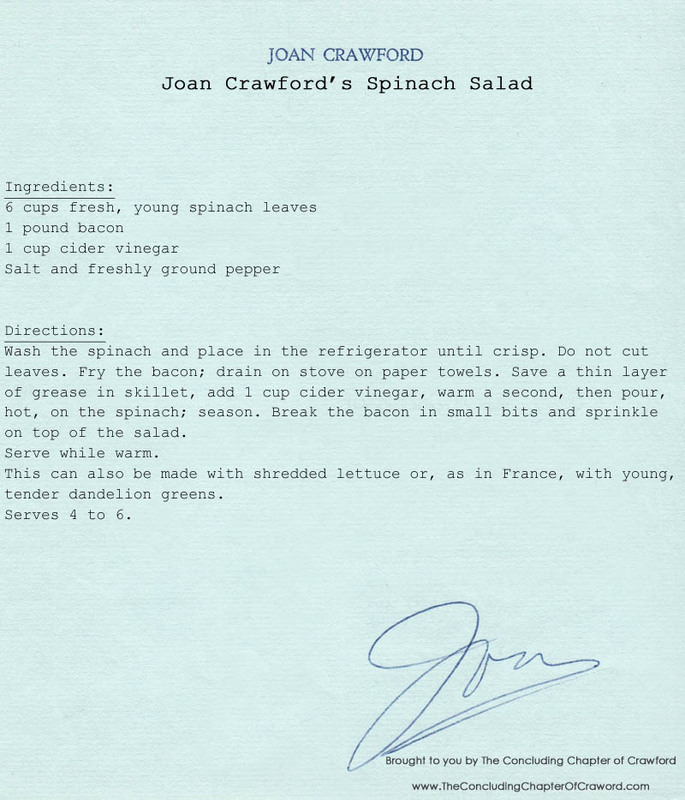 ​This can also be made with shredded lettuce or, as in France, with young, tender dandelion greens.